Public Vigil: News flash: Protestants are not Catholic! News flash: Protestants are not Catholic! All of the sudden the secular humanist press has discovered that Protestants are not Catholic – as if this is news! Hello? Martin Luther, remember him? Anybody home? Amazing how humanists care nothing about religion unless they can use it to justify one of their "human rights" campaigns. Homosexuals suddenly wanting the blessing of the Church for their orgies comes to mind. Suddenly, the secular humanists are the latest and greatest defenders of the papacy against the attacks of the Lutherans. So why do they even care? This is probably just a coincidence, but Michele Bachmann used to be a Lutheran. And also coincidentally the secular press is in full smear mode against Bachmann who is emerging as the likely Republican candidate for President. And Michele is outspoken about her Christian faith which has humanists so scared and confused that they are looking to their Ouija boards for answers. When did being a mainstream Protestant even become an issue in American politics? When that Protestant actually takes her faith seriously and formulates her political campaign on Christian principles. If Michele were a faithful Catholic, then we would be warned about her allegiance to the Pope. That's always been standard procedure for the secular press. Now it seems like any Christian presidential candidate is going to come under attack from the secular press one way or the other. What's really happening here is that Obama and the Democrats are in serious trouble with Catholic voters. The Democrats undying support of abortion and "homosexual marriage" have alienated Catholics who normally support them on social justice policies. 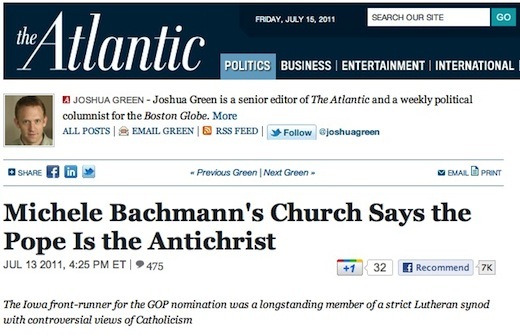 If the Bachmann campaign is able to sway Catholic voters to support her, then the Democrats could be in big trouble in 2012. And they know it. Desperate times call for desperate measures – in this case mud slinging and name calling. Well, body of Christ, don't fall victim of the old divide-and-conquer strategy. Haven't we been talking about ecumenism all these years? Support your fellow Christians. Build bridges. Let's use this as an opportunity to gather the flock. And maybe American Lutherans could use this opportunity to disassociate themselves from the old "the Pope is the Antichrist" heresy. Can't we all just get along in the name of Christ? 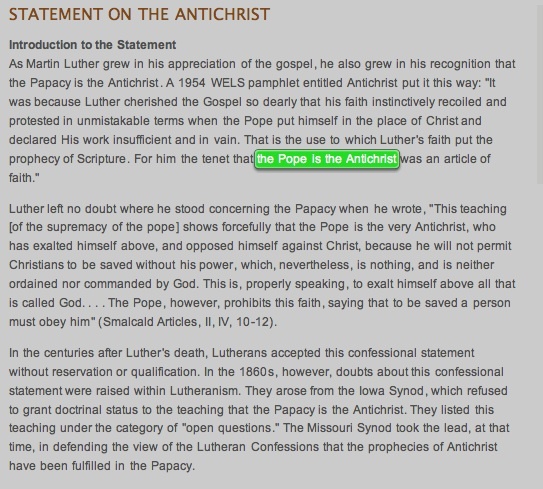 Snapshot of Wisconsin Evangelical Lutheran Synod doctrinal "Statement on the Antichrist"
What next? 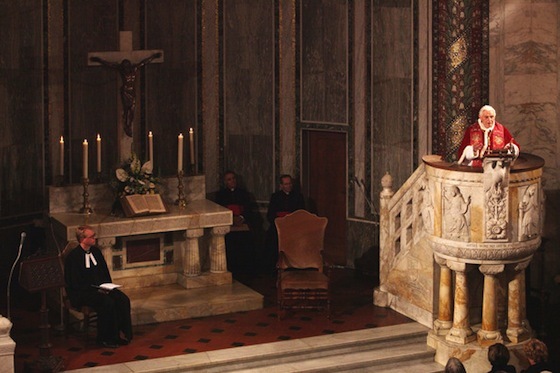 Investigative reports on the question, "Is the Pope Catholic?" Wait, wait don't tell me. I think I know this one. St. Paul the Apostle, you preached the Word to Jew and Gentile, Greek and Roman; you fought against divisions in the early Church. Pray for us. A new article from the Washington Post at last clarifies some of the details about Bachmann's relationship with the Lutheran Church. She stopped attending a Lutheran Church two years ago. The request that she officially remove herself from the church came from the pastor of the church. Bachmann says that she is now attending a non-denominational church, but has not provided the name of the church. This makes me wonder if the pastor at her old Lutheran Church was worried about being put in the spotlight over his sermons and the church's beliefs. If so, you can't blame him given events in the last presidential election. It's too bad that he doesn't take this opportunity to totally denounce the anti-Catholic rhetoric that still exists within the Lutheran church. We hear statements like these are not core doctrines, but that doesn't go nearly far enough. These anti-Catholic doctrines encourage hatred towards Catholics among parishioners and gives them an official stamp of approval. Would they get away with saying similar things about Jews or Blacks? Absolutely not! Shame on you, the Atlantic! Shame on you! My, my isn't the liberal media scared? M. Yes, they are scared! They are going after Bachmann from every angle. This from the liberal "pro-woman" crowd. But if a woman doesn't agree with their agenda then she is treated like a traitor. They hate her more than if it was a man saying the same thing. Because it exposes their lie that they are "pro-woman". They aren't even liberal in any true sense of the word. They are just secular humanists. They want us to believe that you can't be liberal and still be Catholic for instance. For your information, Catholics were liberal before today's "liberals" stole the label. Have you noticed how the secular humanists keep redefining words like 'liberal', 'equality', 'rights', and even 'humanism'? But those were ideological words. Now they want to define fundamental words like 'marriage', 'husband', 'wife', 'father', 'mother', 'son', 'daughter'. There is a real danger that if they are allowed to do this then they will be able to redefine society in a fundamental and irreversible way. Which is why we need someone like Bachmann who has not sold out and is committed to putting a stop to this humanist agenda.